Learn about the health benefits and claims of the worlds second most consumed beverage…TEA! Join us for an informative and fascinating class with Steve Lorch, CEO of Table Rock Company, Ltd. & RN/BSN with 30 years of medical experience. 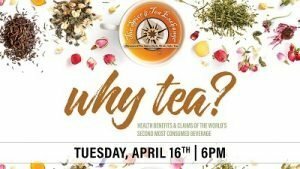 Lorch, a certified tea specialist will be speaking about the health benefits and claims of tea. Enjoy tea tastings and samples all night. Attendees can buy three 1 oz. teas and get one 1 oz. tea for FREE! Good for the night of the event only.